Ohio is home to a number of diverse habitats and several national parks such as Cuyahoga Valley and Shawnee State Forest. Native to these habitats are thousands of species of animals and insects. Some of these species are venomous, including three types of snake and two dangerous spiders. The eastern massasauga rattlesnake is a small species ranging from 18 to 30 inches in length with gray-brown coloring and darker brown spots along its body. Found often in wetland swamps or drier grassy meadows, it is common in southern Michigan and northern Ohio. Not as dangerous as some rattlesnakes, it tends to inject less venom in bites and will generally only bite humans in self defense. The timber rattlesnake is a large species, growing to between 3 and 5 feet in length with a stout body. They have a light brown to yellow coloration with darker thick stripes. The snake can range from New York state to northern Florida and as far west as east Texas, and also lives in areas of southern Ohio. The bite of a timber rattler, if left untreated, can be fatal to humans. 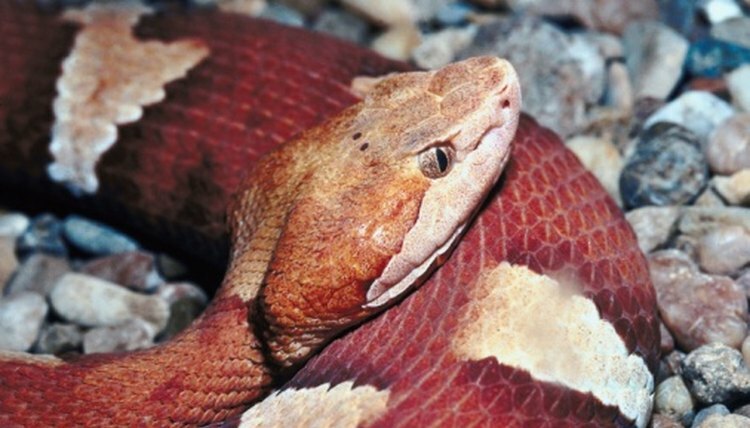 The northern copperhead is a smaller species, reaching lengths between 24 and 36 inches. They have pinkish to gray-brown bodies with darker stripes and a red head. It is the most common venomous snake in Ohio, found in forest environments, hillsides and rocky outcrops as well as broken down rural buildings and wood piles. They are not aggressive and tend to only bite in self defense. The venom can cause serious illness but is not often fatal. The brown recluse is a medium-sized spider up to 3/8 inch in length, brown in color with a darker, violin-shaped mark near the head. Found mainly in the southeastern states, it is not common in Ohio but has been found in the south of the state. The venom of a brown recluse is necrotic: it can make tissue rot. Sensitivity to a bite can differ from person to person with some having a small red bump for a few days and others developing painful wounds that leave scars when healed. Fatalities are rare from brown recluse bites. Two types of black widow live in Ohio, the northern and the southern species. Both are black with the recognizable red hourglass shapes on the abdomen; in the northern species the middle is missing from the shape. They are widespread, living in old buildings or sheds as well as in forests and areas of brush. Bites from these spiders can be very painful, causing muscle cramping and illness, but are rarely fatal.